The Tsunami Book- Killer Waves was written by Dr Gill Jolly, illustrated by Guy Holt design and published by black dog books in 2009. From the moment I picked the book up, I was engrossed. It started with the front cover - an amazing photograph of a tsunami wave about to engulf a town (Yes, it has been digitally altered, but what an attention-grabber!) A quick skim revealed more photographs obviously carefully chosen to be visually stunning, and intriguing snippets of text. Finally I disciplined myself to quit skimming and start reading. Lots of kids love non-fiction. And some of those kids don't want to start at the start and go straight on until morning. The great thing is that both those kids and the more linear kind will enjoy this book. There are text boxes, graphics and captions to appeal to the dippers, and solid but intriguing and more traditional text to appeal to the others. The text is simply and engagingly written. I really loved the way Dr Jolly shows us the human and quirky results of tsunamis as well as the scientific causes and explanations. One of the many things that works well in The Tsunami Book is the lay-out. In some children's non-fiction books, the pages are so busy, they are daunting for kids. In this one, there is an excellent balance of pictures and text, and enough white space for the pages to feel uncluttered. I very much like the way design choices both underpin the text and add to it eg vertical titles for some sections, horizontal titles for others, different fonts to enhance clarity. There's a wonderfully simple and clear wave graphic which helps kids understand different heights that waves reached, and allows them to compare tsunamis at a glance. This book would make an excellent choice for anyone wanting children to learn about visual literacy. There are diagrams, different kinds of images, maps, copies of paintings and signs to investigate. 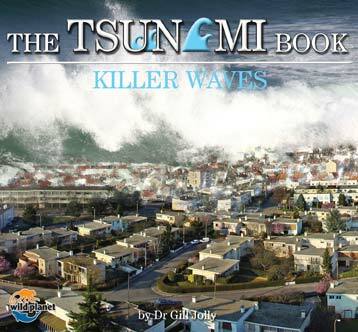 It would make a stunning reference book for a school or local library, being comprehensive enough to satisfy kids who want to know about tsunamis, but also not overwhelming kids with too much detail. If you have a child who isn't really into fiction, this might be a great one to share in a family read-aloud, and perhaps start him off on the road to still more research. Or check out some of the other titles from black dog books Wild Planet series. As for me, I'm off to explore one of the links Dr Jolly provided on the Glossary/Index page. Just checking to see if a killer wave might be coming to a beach near me! Hello! I have been a bit buried with funding reinstatement campaign through Congress...and will continue to be but wanted you to know I do stop by Book Chook when I have the opportunity. I have a great nephew for whom this book will be just right I am sure...thanks for bringing it to our attention! Carol, I have been following your trials! I wish there was something an Aussie could do to help. Tell Congress I love RIF! Boys seem to enjoy non-fiction books like this one before girls do. They are really interested in the way things work. The girls seem to enjoy being swept up in a fantasy. As an adult, I now appreciate these types of non-fiction books. Same with me, Kelly. I loved fantasy when I was young, still read it, but find I read much more nonfiction now. I'm disturbed by the fact that a digitally altered image is being featured on the cover of a non-fiction book. Where do we draw the line between Hollywood fantasies and factual books then? It was decided not to use spectacular images of devastation - one because there was a saturation in the media of these images, two because we didn't want to present tragedy as spectacle. The book aims to tell the story of the human impact of a natural disaster. Maybe we tell stories or facts differently if we have experienced a tragedy closely, in the same country, as opposed to watching it on television half way across the world. What does everyone else feel about this? That's a really good question for us to think about, Malar. Here is my current stance, which might well change after discussion. I look at books primarily from the point of view of getting kids reading. I know I have personal preferences for books that make me laugh and feel good. But that doesn't mean I can't appreciate and recommend books that for instance make us aware of the plight of children in Niger, or fantasies that are set in a dystopian world. I know that many kids are going to enjoy this book. I think they will learn from it, and enjoy reading it. They may well go on to read more about tsunamis after reading this book, or even search for more nonfiction books about disasters. To me, the front cover has been used in a deliberate ploy to get a reader to pick the book up. The publisher noted the picture had been digitally altered, but I would imagine that an enormous wave would look a lot like that when it came sweeping through a town, although I am only guessing from what I have seen on TV and read. I think it is in we humans to marvel over sharks and monster trucks and bush fires and devastation. Hopefully, we also feel sorrow for the loss of life and scarring of environment that can occur. I don't believe tragedy is being presented as spectacle in this book. I do suspect that you are right when you say I might feel differently had I experienced a tsunami directly. I hope other readers will comment, because thinking about these things in relation to books and our kids can only benefit all of us. I agree that getting children to read is important. Presenting a non-fiction book in an engaging manner is definitely a challenge. Tulika has settled on a fact+fiction format for several books to get around this. I'm still concerned that using a digitally altered image to 'trick' people into picking up a non-fiction book is unethical. I wouldn't mind a cover like that on a fictional book though. I remember how stunned I was as a child to learn that it is possible to manipulate photographs or video - I had always thought of these as truth-telling media. That's it! I'm buying this one. I think it's great that Tulika thinks about ethics when making publishing decisions, Malar. I don't think of this cover as a "trick" - more that the designer chose the picture he thought would have the greatest impact and convey the size, force and devastation of a tsunami. It must be very difficult to get photographs of impending disasters, as i imagine most people are fleeing for their lives. Whereas many more pictures of the aftermath would be available I guess. The wrench to people's hearts to witness such a change as you witnessed must indeed be great. Let us know what you think, Kelly!